Scroboscope ransomware uses sophisticated techniques to infiltrate computers and hide from its victims. Use Reimage to determine whether your system is infected and prevent the loss of your files. Scroboscope ransomware is a file locking virus that adds .N0JJC appendix to each of the affected files. 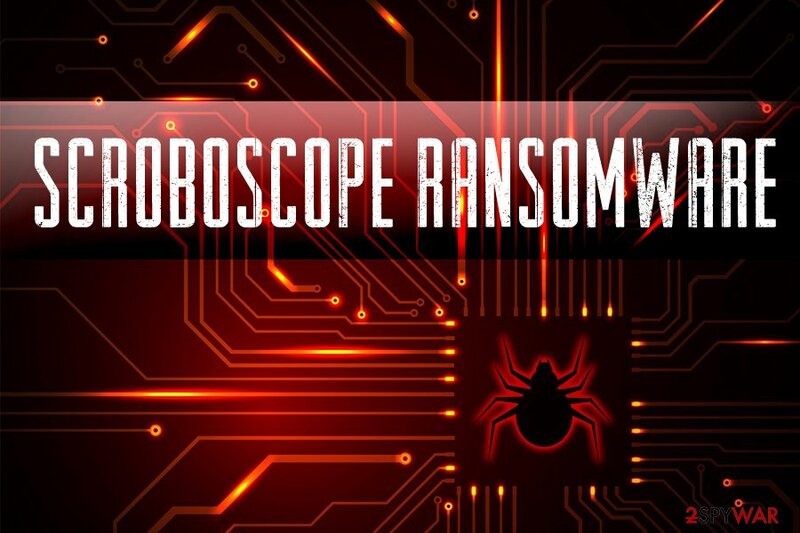 Scroboscope ransomware is a dangerous cyber threat that was first spotted by security experts in early November 2018. It infects computers with the help of typical ransomware distribution techniques, such as brute-force attacks, spam emails, fake updates, and other methods. The malware then encrypts all the personal files on the machine with the help of RC2 encryption algorithm and adds .N0JJC appendix to each of the affected files. Scroboscope virus also contacts a remote server and sends the decryption key together with the personal ID to the attackers. It also drops a ransom note (a text file) that asks users to pay ransom in Bitcoin for file recovery. 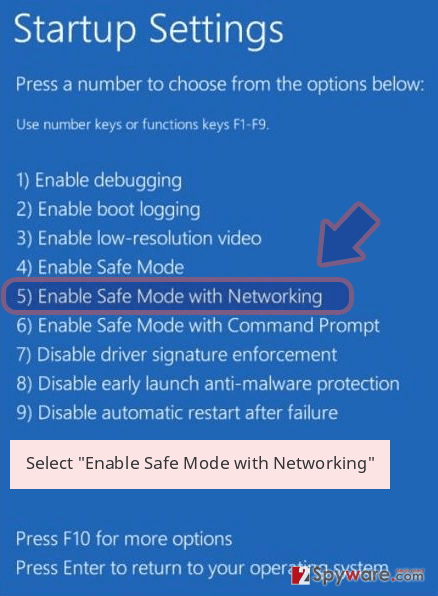 After these modifications are made, Scroboscope virus starts a PC scan and looks for files to encrypt. It usually targets most commonly used file extensions, like .jpg, .png, .doc, .dat, .html, .txt, ,mp4, and many others. Once the encryption process is complete, the virus appends an extension which denies the access to computer users (for example, a picture.jpg is turned into picture.jpg.N0JJC and becomes unreadable by the system). To regain control of data, victims are asked to contact crooks and pay them a specified amount of money in Bitcoin cryptocurrency. However, we highly advise users to ignore hackers as these individuals cannot be trusted. While there is a chance that Scroboscope authors will send the key, they can also choose to ignore the victim. Therefore, we advise users not to rush, remove Scroboscope ransomware and try to regain data with the help of third-party software. Nevertheless, those who are aware of ransomware risks and keep backups of their files will not have any troubles, as long as Scroboscope ransomware removal is performed first. 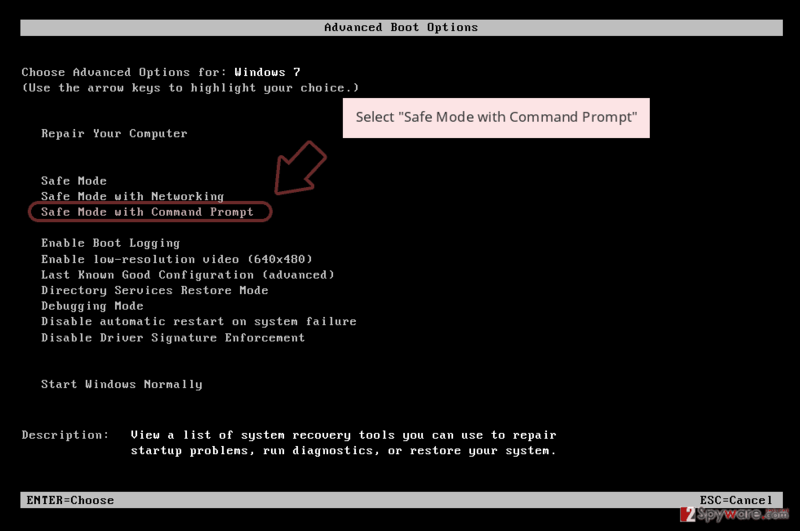 If the remote backup device is connected to the infected machine before the virus is eliminated, however, all the data located in the backup will be lost as well. Therefore, you should first get rid of the virus with the help of security software, such as Reimage, or any other anti-malware application that can detect Scroboscope virus. 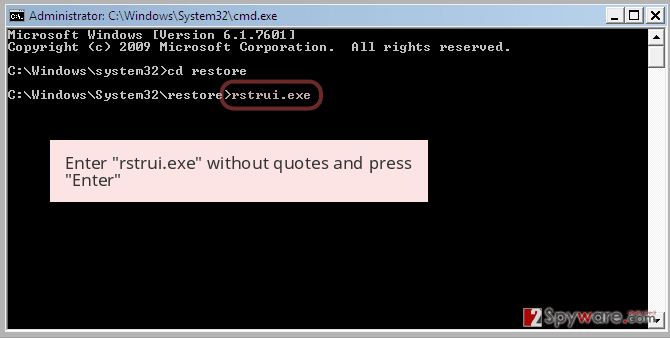 Once you are sure that the malware is gone, try to recover your data. Scroboscope is a ransomware virus that is used to extort money by locking victims' personal files. Users are usually not that aware of the peculiarities of ransomware infection. Most heard news about such infections like WannaCry or NotPetya – just because these viruses were highly publicized and made a significant impact on the economy, healthcare system, and other aspects. 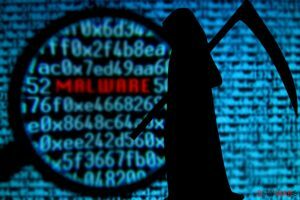 However, there are thousands of ransomware viruses created every month, as well as Ransomware-as-a-service is employed to modify the original script and propagate the threat to as many victims as possible. Avoid downloading torrent files and stay away from suspicious websites. Scroboscope ransomware removal should be the first step to the recovery from the infection. Manual elimination should be out of the question, as various modifications to the system and spawned processes can make that procedure almost impossible. 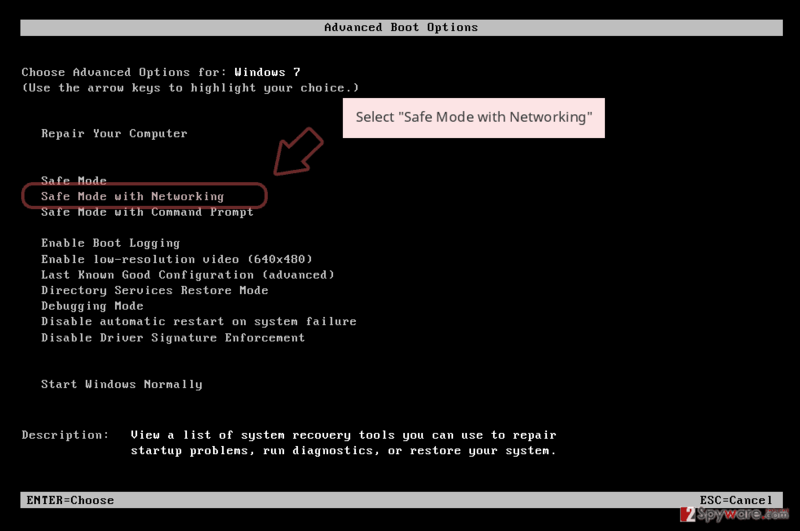 To remove Scroboscope virus without much trouble, you should enter Safe Mode with Networking as explained below and perform a full system scan with Reimage, or other software that can recognize and get rid of the threat. Log in to your infected account and start the browser. Download Reimage or other legitimate anti-spyware program. Update it before a full system scan and remove malicious files that belong to your ransomware and complete Scroboscope removal. When a new window shows up, click Next and select your restore point that is prior the infiltration of Scroboscope. After doing that, click Next. 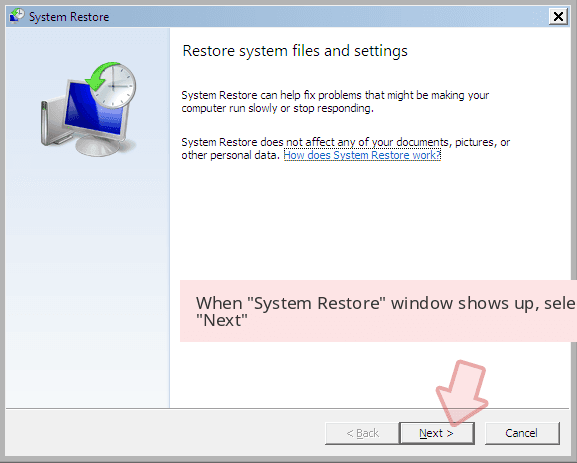 Once you restore your system to a previous date, download and scan your computer with Reimage and make sure that Scroboscope removal is performed successfully. 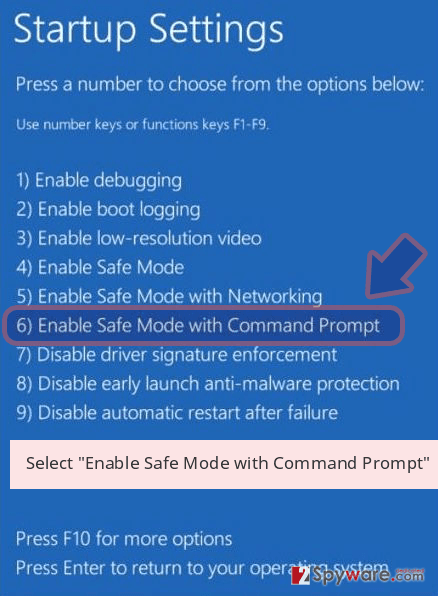 Guide which is presented above is supposed to help you remove Scroboscope from your computer. To recover your encrypted files, we recommend using a detailed guide prepared by 2-spyware.com security experts. Data Recovery Pro is a professional tool created to recover accidentally deleted, or otherwise lost files. However, some users found that it can be used to recover files blocked by ransomware. 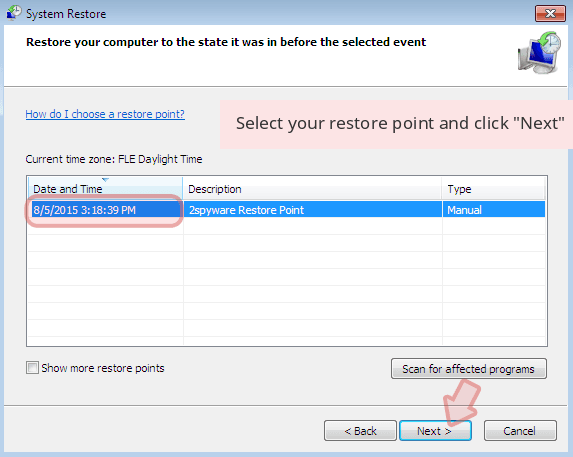 This option is only viable for those who had System Restore enabled before the Scroboscope virus struck. While most of ransomware viruses attempt to eliminate Shadow Volume Copies, not all of them succeed. Therefore, you should try to use ShadowExplorer and see if it helps you. ^ Brute Force Attack. Technopedia. Site that helps to understand technology. ^ RC2. Wikipedia. The Free Encyclopedia. ^ 2e58a204a608e66a67ad24c263146490718f7021fdd7d5e09627a4b34283b7fb. Virus Total. File analyzer. This entry was posted on 2018-11-28 at 06:19 and is filed under Ransomware, Viruses. You can quickly scan the QR code with your mobile device and have Scroboscope ransomware manual removal instructions right in your pocket. How did you remove Scroboscope virus?